What is the Blast Ball Division? 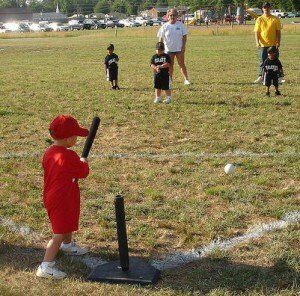 Blast Ball, the introductory program of Oakville Little League, was developed as a fun way to teach all five fundamentals of baseball…hitting, throwing, catching, fielding and running for the young player that are the age of 4. Simplicity and continuous action is what makes BlastBall so much fun. There are no complex rules, no umpire is required, and you don’t even need to have a baseball glove. Blast Ball is played with a “soft” ball and a moulded bat for optimum safety. The batter hits the BlastBall off the BlastTee and runs to the BlastBase, which “honks” when stepped on. If the batter reaches the BlastBase (which is the only base used) before a defensive player either catches the BlastBall in the air or fields it and yells “Blast”, he scores a run. It’s fast, it’s fun, everyone hits every inning, and the kids really learn the game of baseball properly. Parents will love the game because of the continuous action. Kids will no longer be coming home with their pockets full of rocks and dandelions! BlastBall “Game Day” includes a period of instruction followed by an action packed game all completed within 1 ¼ hours. Games are usually held on the same day each week (Wednesday) culminating with a season ending Blast Ball Gala and Awards Day.